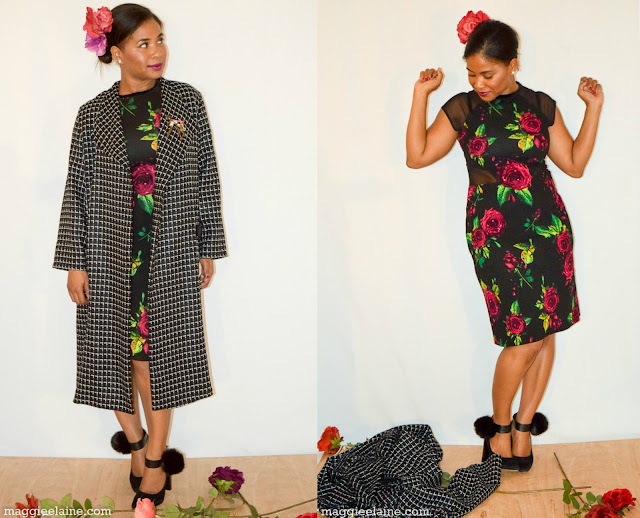 Clothing Hacker: Fashionista Fashion Challenge wrap-up and other ramblings. Fashionista Fashion Challenge wrap-up and other ramblings. Wow, this post is more overdue than I realized! 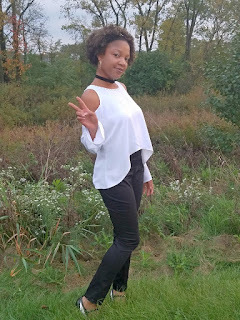 The Fabric Mart Fashionista Fashion Challenge 4 is over and the winner was announced way back on Oct. 11. Congratulations to the very lovely Tee from Maggie Elaine, who won with this gorgeous ensemble inspired by Dolce and Gabbana's Fall/Winter 2016 collection. And congratulations to the other two finalists who also got nice prizes, LaTonya from Sew So Petite and Elizabeth from Elizabeth Made This. The tank and cardigan coordinate well with the skirt, fit and drape beautifully, and look very comfortable and wearable. They’re simple pieces, but well done, and they look great on you. It looks like the hems could have been a bit better stabilized to prevent tunneling, or the machine settings adjusted. Brave of you to work with such a tricky fabric for the other top! The fit looks pretty good, perhaps a bit snug across the shoulders in back. I'm not sure the satin fabric is the best choice for those gathers on the shoulders and sleeves - the stiffness makes them look a little messy, though the lighting is also extremely unforgiving. The lapels look like they need a little more pressing to make sure the edge is crisp and the seam rolls nicely to the underside, or maybe edgestitching if the fabric doesn't hold a crease well. It was hard to see the details without some close-up photos…It seems like the colors probably match quite well to the plaid in the skirt. Jacket-top: The satin seems soft and can be tough for even the most experience Seventh Avenue seamstress – without adding interlinings, etc..to get at least some crispness at the hems. The cardigan and tank set look great. The fit is nicely done and drapes well too. I could see them worn together or separate and with the skirt or with other things you may have in your closet. Burgundy is so in right now, and you're all set! It's a bummer the lace top didn't work out. I would have loved to see it. The blazer was a good idea, but I don't think it turned out as well as it could have. I think some facings, interfacing, etc would have helped it, but the fabric was a tricky one. I think a different fabric would have worked a little better. It would be nice to see it in natural light since the shine in the photos brings more attention to the wrinkles. All in all, it was a really great (and stressful!) experience to be a participant in this challenge. I definitely have a whole new respect for the designers on Project Runway who do so much more in much less time that I had. And I was happy to actually get some sleep the weekend after my elimination. I do plan to go back and revisit my trench coat. I had to leave off the epaulettes and the cuff straps due to time restraints and I didn't top stitch the lapels at all and had to stop top stitching the belt because I ran out of the thread color I was using, which I have since re-aquired. I also will add some frog closures and I've decided I would like to add a hem band of the blue sateen at the bottom to add a little length and balance out the blue at the collar/lapels. I just have a few other projects that have higher priority at the moment. I have barely been at my sewing machine since my elimination -- the only project I worked on was a Good-To-Go Messenger Bag from Two Pretty Poppets with my 8 year old neice, who was in town last weekend with her family visiting us. 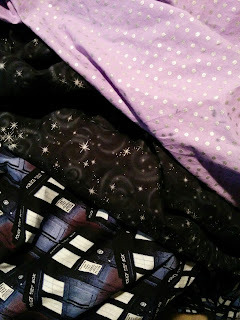 Of course, I didn't even think to take photos, but we made the small version out of these fabrics she picked out at JoAnn. I love her fabric selection and I love how the bag turned out. It was a quick make, even spending a lot of extra time showing an 8 year old how to use a sewing machine. My current project that I've only barely started is my Halloween costume. I can't share my plans yet. We have a themed decorating contest between the floors in our building and it's a carefully guarded secret what our theme is and I know at least one person from another floor who very well might read this blog. But I shared this photo on Instagram. 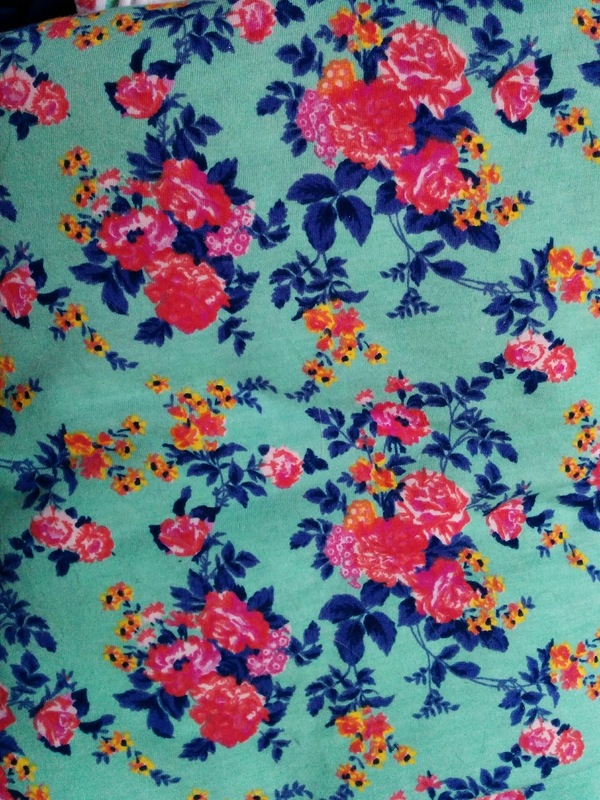 And after my Halloween costume is done, I'll be starting on a Named Olivia Jersey Wrap Dress, which I picked up as part of The Monthly Stitch's IPM Pattern Bundle 01. I'm very excited to try out the pattern and I have a few slightly flawed knits I've picked up from Girl Charlee's bargain lots* to choose from as my (hopefully wearable) muslin. I think I'm going to use this one. Hopefully I'll get my costume completed in time for our contest on Friday and I'll be able to post about it next weekend. 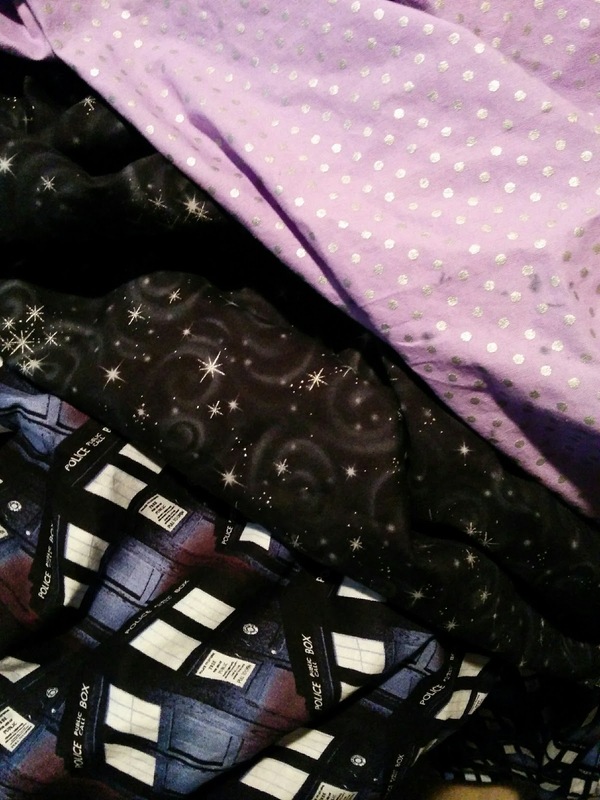 *Disclaimer on Girl Charlee's "slightly flawed" lots -- I've purchased many of them because they are inexpensive fabrics that are often very pretty and only have slight flaws along the selvege or small things that can be cut around, so they are great for wearable muslins. But I've had terrible luck with the woven bargain fabrics I've purchased and I've gotten a couple things that are completely unusable and all sales are final. I was sad to see you eliminated, but I'm happy I found your blog through the contest! Hopefully you got some good exposure. Thanks. I'm glad you found my blog too! I'm not the most consistent blogger and I'm not really doing it for the exposure, although it is fun to know people are reading it. But I mostly want to be able to keep track of the items I make and as a sort of accountability to myself to reach specific goals or meet particular deadlines, etc. If other people happen to enjoy my makes and maybe even find some inspiration here and there, then that's just a nice bonus!